Cindy McGonagle, Garden Notes from the Nature Devas. There is a sense of sheer delight that comes from working with the Nature Devas. With their help, I have developed a wondrous, magical and spiritual self-expression to lovingly share with the Earth. Some of my greatest rewards have come from sharing with others who are also awakening to their roles as caretakers of this planet. I hope by utilizing many of the methods in this book that you will discover your innate, telepathic and visionary talents working with the Plant and Mineral kingdoms. Learn which nutrients you need to produce vibrant flowers and food using organic amendments and pest control alternatives. 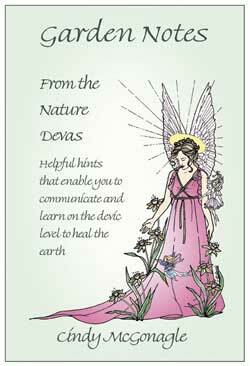 Recognize your role in working with the Nature Devas to send love into the land where you live. Find ways to invite Nature Spirits and Fairies to your home and garden. Be part of the creative magic that happens as you incorporate the messages of the Nature Devas. To order call 503 531 2758, please note we no longer ship outside the continental United States.